Thai massage is based on yoga theory introduced to Thailand 2,000 years ago. Using stretching and acupressure techniques, its aim is to aid the flow of energy around the body to restore balance, in much the same way as yoga. In a more Western model, used in osteopathy and myofascial release, pathways resembling the Thai energy lines are described as connecting the muscles of the body. By a process of unravelling, the therapist can release tension and encourage healthy patterns of movement. Thai acupressure treatment works in a similar way to trigger point massage therapy and treats chronic or acute pain. In Thai acupressure, the client is actively involved in identifying the exact location of beneficial pressure points. Just one treatment can result in a substantial reduction in symptoms. Usually, two or three treatments are necessary for lasting results and monthly follow ups are recommended to maintain healthy patterns of movement. Treatment of your specific acupressure points is embedded in a general Thai massage to achieve full body relaxation and myofascial integration. How does thai massage work in the office? For years, there has been a sense that going to the GP with a bad back, sore neck or frozen shoulder just results in the standard brush off, or a long waiting list, or a life of painkillers. It’s no news that there are alternative forms of therapy which are effective when pain seems to defeat conventional medicine, but without trying them all, how can you find the ones that work? Thai massage is rapidly growing in popularity, with new therapists continually joining the scene. It is a practical and proven treatment for both commonplace and complex issues. It is a clothed massage and therefore perfect for the office. Thai acupressure is deep and effective and targeted to problem areas. 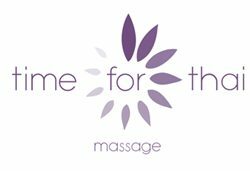 I have been working part-time as a thai massage therapist since 2007. I trained in Chiang Mai in 2006 and also completed practitioner training in London and Mumbai as well advanced training. I have also been a RYS qualified yoga teacher since 2006. As thai massage is so closely related to yoga, I use the awareness I have through my own practice of yoga to facilitate balance in the client’s body. I have been giving office massage, incorporating thai theory and techniques since 2014, and have many happy clients who can testify to the restorative powers of 20 minutes in ‘the chair’.